The Filtermist FX range is made up of three oil mist collector units with airflows from 900 to 1400 CFM. FX oil mist collectors are available with a number of mounting options including floor stands, machine mounts and the mobile CSX unit. Filtermist oil mist filter units are designed to operate efficiently on a wide range of industrial power supplies. All oil mist collectors have a number of accessories available including afterfilters to purify the exhaust air and fishtails for close up collection on open machines. 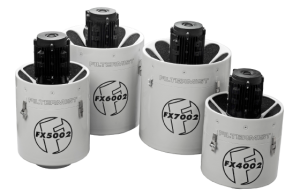 Filtermist FX and S series oil mist collectors are available in standard mild steel construction and also stainless steel versions for use in hazardous or corrosive environments.